Seeing this notebook in the The Works store in Southport, I couldn’t resist but buy it. It looked like it had character. The paper didn’t have the sterile and boring look printer and copy paper has. It looked a bit rough and it looked a bit as if it was made on older machines – and even better: it’s Made in USA, you see too few of these products here in Europe. There’s the occasional Scotch tape, Made in USA (I’ve even seen these in China), and there’s the occasional pen and eraser, but that’s about it. Other promising details on the cover are: 100% recycled, more smear resistant, easy erase, less bleeds. I cannot deny that I was quite disappointed after trying the paper out. One claim is not true – Less bleeds? The ink is bleeding was bleeding through the paper at a phenomenal rate. I was trying to write as fast as possible to compensate, but no use. Unless the paper was stored wrong when being shipped to Europe or unless ‘less bleeds’ refers to the sheets having softer edges, resulting in fewer paper cuts at the edge of the paper (‽), ‘less bleeds’ is certainly not an attribute of this paper. Good news however regarding the ‘more smear resistant’ and ‘easy erase’ claim. It is easy to erase graphite from this paper and the paper is definitely more smear resistant than probably any other paper I know. The paper is very soft, but the surface is rather unusual. Graphite does not stick to the surface as it does on most other paper. This results in most pencil strokes looking very light, certainly much lighter than usual. 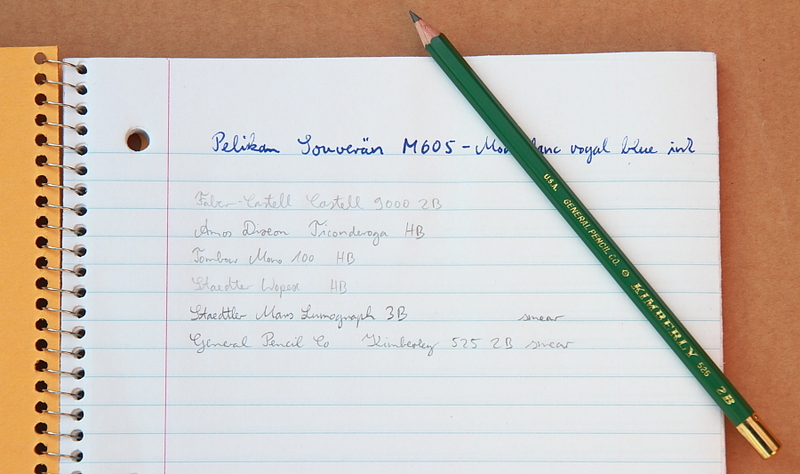 Some pencils like Faber-Castell’s Castell 9000 2B leave much lighter marks on this paper than on other paper. For other pencils the difference is not as big, most notably for the Chinese made, yellow Amos Dixon Ticonderoga HB, a pencil I came to like. The pencil point of this Ticonderoga does not last very long, it is being ‘eroded’ at an incredibly fast rate for an HB pencil, but it does write well and, I am sure I heard this before in the context of the Blackwing, the lead being used up so fast makes you feel like you’ve done some work1. The American-made General’s Kimberley 525 2B yielded excellent results, too. I assume the Norcom notebook #77073 is either not being made any more or is not made for the American market, as it is not listed on Norcom’s website. At 59p (~ 92¢; 67c) for 70 sheets this notebook provides excellent value for money, but the paper is not really suitable for use with pencils and definitely not suitable for use with fountain pens. It’s probably more than adequate when used with ballpoint pens. Kent for the Dixon Ticonderoga. More about the General’s Kimberley 525 at pencil talk. It’s always funny to me when I see an American-made product oversees that I’ve never seen at home. But most importantly: excellent deployment of the interrobang! Ah, the eternal search for a good, solid notebook. The Americans are so good at “spinning” (Harvard and all that), “…less bleed” (than what?) a very open ended statement, just the sort they are very good at – no legal problems here. That Kimberley 525 looks like a lovely pencil and the gold ferrule is very attractive. in my haste the last comment may have read as a little negative …should have been more correctly written as American Marketers – no problems with my american friends. About the bleeds, ‘fewer bleeds’ was the first thing I thought of, when I read ‘less bleeds’. I make more than my fair share of mistakes when it comes to English grammar and language, but I often spot the use of ‘less’ instead of ‘fewer’ by native English speakers who don’t seem to mind. BTW, here in the UK there is a common sign near many supermarket checkouts: “Ten items or less”… (Uh, another chance to use the interrobang). Kevin, this marketing gobbledygook is becoming more and more common. At least here in the UK you can find it in adverts anywhere, I can also feel this dark side of the force getting stronger in Germany. If hasn’t arrived in Australia yet: Brace for impact. Going shopping with my wife usually makes me notice it much more than in a more manly environment. This dark force is very strong near make-up counters or other beauty products. You read sentences like “30% bigger eyelashes” – and I don’t know anything.. How did they measure this? It doesn’t say longer, it’s not about the surface either I guess, bigger would imply that they are talking about the quantity of three-dimensional space enclosed by the eyelashes, but the picture (a drawing, not a photo, so even more difficult to believe) showing the before / after eyelash shows that this is clearly not what they meant as the two eyelashes on the picture have a phenomenal size difference. If it’s not measure, but someone said it looks 30% bigger, where does that come form, is it anecdotal evidence or was there a sample, what about the sampling frame, population, sampling method, control group? and most important, as in your comment: bigger than what? Bigger than before using the product? On the picture that accompanies the slogan the difference is much bigger than 30%, whichever way you measure it. I just give up, it’s as bad as all the adverts that read free this or that when you buy something else. Isn’t it then a set and you pay for both? The other item is of course not free (I’m waiting to see a sign like “Free seatbelts when you buy this car” one day). About the pencils, the Kimberley looks lovely, it also has this nice look like items made in the past – on old machines. Initial experience suggests that it’s a nice pencil, but I have to use it more to be sure. Longer user of General’s yellow pencil showed that it’s not as good as some other yellow pencils, but General’s Kimberley might be a better pencil. Caution: English as a second language ahead 😉 As someone who works with the German language every day I always try to be understandable and correct. To me, the marketing gobbledygook in Germany gets sillier every day. I don’t mean to appear as a grouser but if one or the other company would assign the task of creating slogans, imprints and the like to those who are familiar with their mother tongue, have a sense of language and know their limits most of the embarrassing appearances could be avoided (maybe even to the pleasure of the sales departement that has to watch fewer customers fleeing). Gunther, do you have embarrassing examples? I’d be very interested in seeing how bad this has become in Germany. What I wonder, though, is to what extent using English slogans in Germany is meant to strictly communicate vs. its aesthetic connotation. Clearly, no German citizen better-understands a product because it has an English slogan! Take for example how characters from Asian languages, mainly Chinese and Japanese, festoon everything from t-shirts to wall-hangings in the U.S., and most of us just trust that they mean what we’re told they mean by the retailer. In other words, it’s strictly a graphic device (if you can’t read those languages) but has an aesthetic gravitas. And the more calligraphic = the more “wise” its meaning must be! Anyway, what I ‘m curious about is what type of products are using English slogans in Germany, and whether you think it’s to target a wider, international audience, or is there something about using English that might make the item more appealing to Germans? I can’t imagine what that would be. It must be the latter, and some have even overshoot the mark by offering a rucksack as “body bag”. Ouch. Sean, in my opinion English is being used to be cool, hip and international (BTW, cool and hip are English words also used in everyday German). For companies the feeling of being part of an international community might be the driving force in many cases. This is however not done consistently. In the 1990s I used to work for a company that produced a software called “Euro Route”. To sound more international everyone pronounced “route” the English way instead of the German way, but no one noticed that to be consistent “Euro” would have to be pronounced the English way, too. I only noticed this when a friend asked me to write down “Euro Route” in Katakana (Japanese). What I want to say is that having an inconsistent mix of English and German is quite usual and nobody really thinks about it. I would classify English words, used in German, as follows (others might disagree). English words where German alternatives did exist for a brief moment in time before the English word became common (e.g. airbag, firewall). English words that have German alternatives and both, the English and German word, are being used (e.g. computer, team). English words that are being used in German, but with a very different meaning and where no common German alternatives exist (e.g. handy, oldtimer). English words that replaced the German equivalents quite a while ago (e.g. star, show, make-up). The German alternatives are rarely used. English words that are used by teenagers and that replace the German equivalents for no apparent reason (e.g. sorry, game). I do find words from the last category irritating and am probably not the only one with this attitude. Consultants and people in marketing also seem to use English words instead of the common German words, either to feel more important or intelligent or to use this as a reason to make things sound more complicated and charge more. I would assume this situation is more or less similar in all non-English speaking countries. Maybe Henrik could tell us about the situation in Denmark. Gunther might have some additional or different ideas about this (I left Germany ten years ago and am not necessarily up-to-date). After reading your post, and taking into account the caveats, I went to the Works in Aberdeen and bought six — two with a big smiley face on the front, the other four with the same design as shown above. I’m pleased with them, though I am a fan of 15lb American paper generally; I found them okay for graphite use (having tested them with Mirado HBs and a CDT), and I like their character. I haven’t tested with ink, but I rarely write anything except letters in ink anyway, so bleed isn’t a huge issue for me. At two for £1, I think they’re an excellent buy. 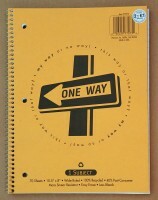 Koralatov, does the ‘smiley face notebook’ have the same paper as the ‘one way notebook’? Did you notice that pencils leave lighter marks on this paper than on other paper? Since this is recycled paper with post-consumer waste I wonder whether the attributes of the paper change depending on what type of paper waste being used, i.e. some batches might not resist and repel graphite as was the case with my notebook. 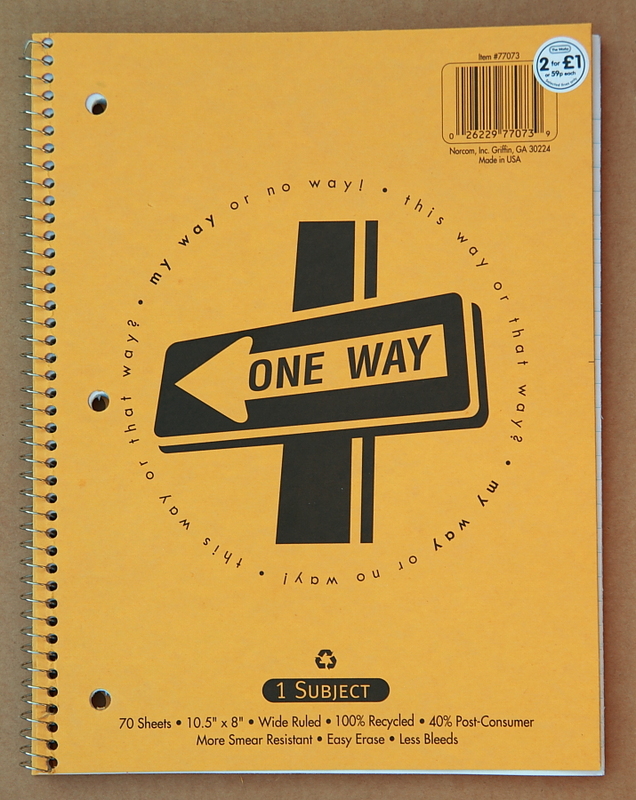 Both the “Smiley Face” and “One Way” notebooks have the same paper in them; they appear to be all the same notebook, just with a different design printed on the cover. I tested on a random page of all six I bought, with the same result. I did notice that one of the “One Way” covers is marginally more orange than the others, but appears to be made of the same paper stock, just a touch darker. I also saw a flowery design, one that said “No Homework”, and another that said “Class Cancelled”. I bought the “Smiley” and “One Way” books because I liked those designs best. Graphite is definitely a touch lighter on this paper than most; it doesn’t seem to “stick” in quite the same way as other papers, and my pencils don’t seem to become blunt quite as fast. I also noticed that there’s almost no graphite transfer between pages when writing on the reverse of them, which is very unusual for paper so thin. The more I use them, the more I like them — cheap, made in USA, with good paper, and a lot of character. I also love the size: it’s almost, but not quite, the perfect size for me (B5 is my ideal size of notebook, but is sadly uncommon outside of Japan). Should have mentioned in my previous comment that I tested with a few different pencils: a US-made Mirado HB, a Staedtler Noris B, a Mitsubishi 9800 HB, a Craft Design Technology HB, and a Faber–Castell 9000 HB. I tried a variety to see if it was just certain pencils that came out lighter than expected, but they all did. Koralatov, thanks for your observations. For me the performance of some pencils on Norcom paper seemed to be closer to their performance on “normal” paper, but not the Noris or 9000, I haven’t tried the others. I wonder which lead ingredient makes a difference (wax?). If I see The Works again (none in Preston) I’ll probably buy some more, too. For any who are interested, I bought a few more of them, including one of the “Class Cancelled” and one of the “Flower” designs. I’ve uploaded a terrible quality photo of them and the “Smiley” one here, in case anyone wants to see some of the other designs. The photo isn’t great, but it should give you an idea. Koralatov, in my opinion the different Noris pencils behave quite similar (like the Tradition 110). I plan to write a blog post about Noris pencils from different factories, but there are a few other posts I want to write first. Thanks for sharing he photo. The one on the left reminds me of washi paper tape. The one in the middle makes me think of Sean’ comment about the odd language. I’ll have to get some German Norises in B to do a side-by-side comparison myself, just to satiate my own curiosity. I’d love to read your impressions of the difference, or lack thereof. I like the variation in the covers on the notebook. It makes me think they’re using a bunch of designs from their archives to make a variety of covers for the notebook. The “Class Cancelled” one does have some slightly odd language on it, but I took it as being American English rather than an impersonation. “Less bleeds” is just bad English, and “my way or no way” strikes me as someone older trying to sound “hip”. ← I took the Pepsi Challenge!